With DaCast’s platform, you can implement restrictions for embedded video players which give users more control over their content and more protection against piracy. There are two types of restrictions you can apply when you embed live video stream content on a web site: geographic and HTTP Referer. Geographical limits allow broadcasters to prevent specific geographic locations from streaming their content. Broadcasters sometimes restrict their streams because of copyright and licensing agreements in those countries. Referers are used to safeguard your video content from being wrongly used or pirated. They prevent people from taking the embed code of the content without permission and attempt to rebroadcast it from another website. With how much video piracy there is today, being extra cautious is a good thing. 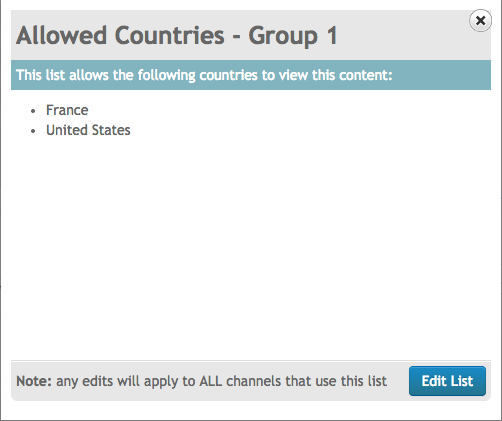 DaCast’s default setting is to allow ‘All Countries’ but you can create a new list of countries that you want to receive the broadcast (all countries excluded in your list will not be allowed to view the stream). 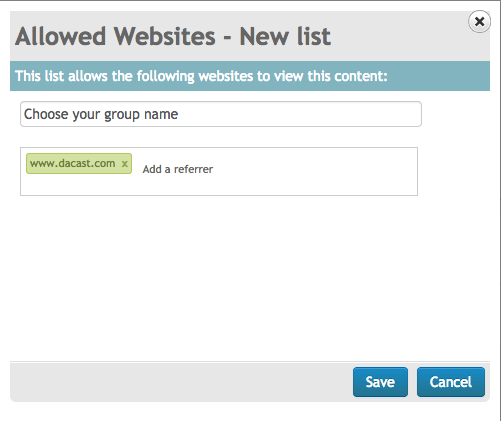 To create a new list (group), click on “Add New”. The first box will ask for you to name the group. This becomes an important step because you can save your list of countries to easily access them again for any new content you are broadcasting. 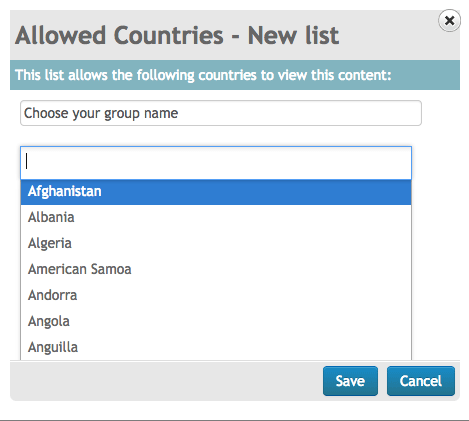 The second box, once clicked on, will bring up a drop down menu with a complete list of all countries. The list is displayed in alphabetical order, but you can search for any country by typing in the box. You can add up to 60 countries to your lists of allowed countries. Besides the licensing and rights issues for implementing country restrictions, there may be marketing issues. Certain sponsors may not want their ads playing in specific regions or countries. Market research might show that their product does not get the response to warrant paying for ads in that country or their product simply isn’t sold in that location. Sometimes the cultural differences lead companies astray when broadcasting advertisements in different parts of the world. A classic story is when General Motors introduced their new car, the Chevy Nova in South America. In Spanish “no va” means ‘it won’t go’, which led to poor sales until GM noticed it’s blunder and changed the name. This by many accounts actually never happened, however it does show how important different cultures and geographic regions can affect marketing and advertising. To recap, referers are used to prevent pirates from taking the embed code of the content you are trying to publish. With how much money is made by pirating, referers add that extra level of security and can be very reassuring. Referers can also be setup under DaCast’s ‘Publish Options’ menu. Similar to the Allowed Countries aspect, you can create a list of allowed websites on which your embed would be able to work. The process to create a list of referers is the same as the restrictions process above, but we will cover them again. Click the ‘Add New’ button to bring up a new window. You can add a group name to identify them later on. Below that bar, type in the websites on which you want to allow embedding on. You can save these groups (which is why it’s a good idea to come up with a unique and memorable name for each one) and can access your saved groups by hitting ‘List’ right next to ‘Add New’. Let’s just say, for example, my website’s called nick.com (not associated with nick.com at all). I have my video on demand setup through DaCast and they give me an embed code to use. I copy and paste the embed code to my website. Four minutes later, on the other side of the globe, an individual (we’ll call him Jack) is watching my video. He really likes the video and wants to try to make some money of his own off of it. He finds the code of the video and looks for the HTML. Jack the pirate thinks he’s hit the jackpot with this video, but when he tries to embed the HTML on his own site, the video is blocked and justice prevails. Thanks DaCast! Referers do not work when you embed with the iFrame, only with the Java Script version. Don’t get discouraged though. 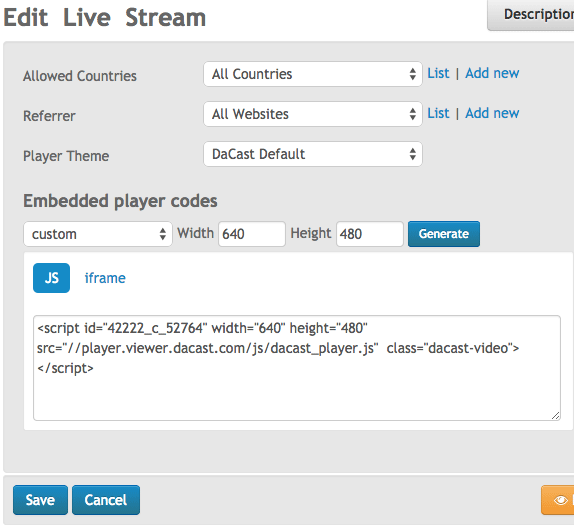 DaCast offers iFrame protection and if at anytime you find your content being shared without permission from an iFrame, DaCast will disable the code and your video can no longer be played through iFrames. They also block potential content thieves looking to steal content by pulling out the direct URL from your embed code and sharing or embedding it in other places. The bottom line is these two features come standard with Dacast’s platform and can be a huge lifesaver for anyone streaming content. Geo-restrictions can be useful in a number of different scenarios. While most may use it because of licensing and right to broadcast issues, some will find that running advertisements would be best served in other parts of the world. Marketing can certainly play a factor in where, or where not, you decide to broadcast your content. Ahoy matey! 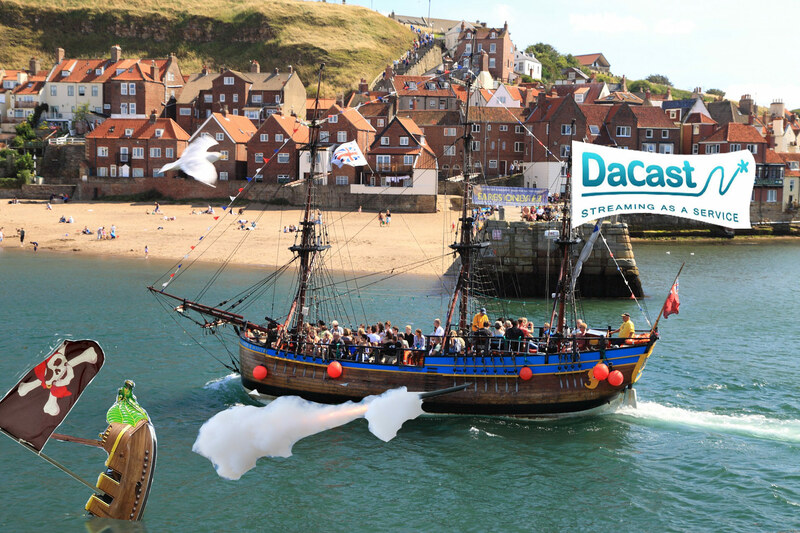 DaCast takes down pirates. Unfortunately, pirating occurs in all industries and can happen to anyone. Always take precautions with your content as this is your hard work and dedication. With referers, it gives you that extra protection needed to prevent others from accessing and distributing your content without permission. Remember, iFrame doesn’t work with referers but DaCast offers iFrame protection and will put an end to any unwanted pirates on your content. By: Nick Small. Follow me on Google+ for more blogs like this. Why You don’t provide referer protection with iframe? I’ve seen such solution with other services.